The hotel is rich in anion as high as 7,000 units and can help metabolism, elimination of fatigue, soothe and calm emotions; the anions and rhythm of pleasure result in the most valuable medicine. While you are at it, you will feel more youthful and marvel at the wonders of the nature! The bamboo forest at Damyang certainly makes a big deal about it too. At the small stone cottage that serves as the ticket office, there is a large LED display to tell the freshly arrived, among other things, the temperature, the humidity, and the anion measurement. I didn’t think much of it at the time, but now anions are crossing my radar in the most surprising places and products. A quick Google search reveals websites extolling the virtues of the anions present in bamboo charcoal for bed sheets, sanitary pads, yarn, health-caring quilts, bamboo charcoal soap…. and that’s just the first page. 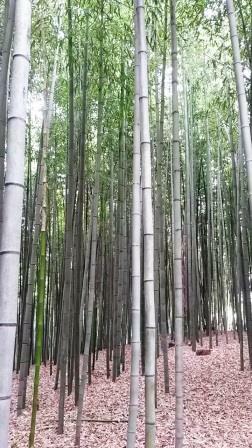 We walked in a bamboo forest after our marvellous bamboo lunch, as recommended by the owner of the roadside diner. 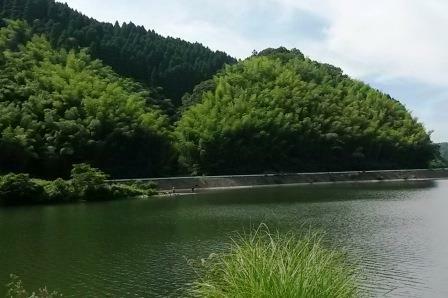 It is a lovely place, beside a small established dam. This bamboo forest lacked the crowds and well-trodden paths of Juknokwon and Arashiyama. It was an abandoned commercial forest by the look of it. There were a few decrepit shacks, an old kiln, and a general atmosphere of damp decay. On arriving at our next stop I noticed a slight squelchy feeling between my toes. Thinking there was some mud there, shoes were removed for inspection. Not mud. Leeches, from the bamboo forest. 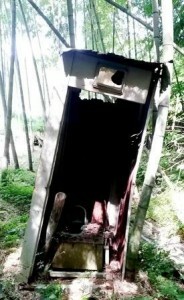 The forsaken outhouse, pictured on the left, now features its own built-in bamboo hand-rail, for assisting that rise from the squat. 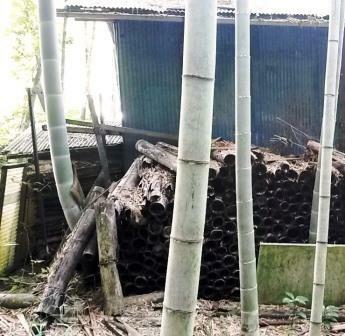 This entry was posted in All, Bamboo around the world, Food, Home and Health and tagged anions, bamboo, bamboo forest, health, Japan, negative ions on 25/07/2014 by Deb.